A habit is defined as a repetitive behavior that has become automatic. We usually group them into good and bad habits. We can all probably list some of our own bad habits and probably even some good habits. Yes, we have things we do habitually like our morning routines; maybe an early workout, then a shower, shave, or you put on your makeup, then coffee or tea, then getting to the office or workplace, then lunch. On the weekend maybe a work-out (or sleep in), coffee, bike ride, NY Times on Sunday…. . But I think these are really more like behaviors or rhythms, comfortable routines that we create, than habits. Because most of the “habits” we think we have, aren't really habits. They are “Cognitive Scripts”. These are the scripts of how we believe things should or will play out in a certain situation. It is the template for a given situation based on our experiences from the past. It allows us to comfortably exist in different situations by giving us a script or story of how the situation should play out… or at least how it is supposed to play out. Because sometimes things don’t seem to fit with how we think they should fit. This is called “Cognitive Dissonance”. We do not like dissonance. So in order to keep our “reality” consistent we sometimes “alter” the conflicting conditions or reduce their importance in order to bring our reality back into “balance”. We do this by changing our belief about the conflicting condition or by denying the existence of the conflicting condition. An example: Let’s say you desire something that is very expensive but after being unable to find the funds to purchase the item, you tell yourself that it wasn't really that great or you didn't really need it and so you change your belief. Another example: You taste the grapes in the fruit section of the market. You know it’s wrong but you tell yourself it’s OK because you needed to taste the grapes to see if they were any good. You know it’s really shoplifting but again you changed your belief. So you can see that what we are saying to ourselves, that is, what we decide to believe, right now becomes our script. We are writing out the script of our life. We are deciding everything- who we now are, how we are going to operate and what we now believe. We are actually writing our own play or movie and deciding what character we are going to play. So when it comes to old habits or really old beliefs, what are you going to believe? What do you want to believe?And what beliefs are you going to change to match your new script? You do know your script…..? Right? Is it the correct script? The one for the character you really want to play? Not the old character but the new character, the one that reflects the real you? Not the one with all the same old “habits” and routines but the new improved model, the one from the new script? Habits and routines are OK as long as you remain aware of them and don’t let them define you. To keep them in check, every once in a while go off the reservation, do everything differently. 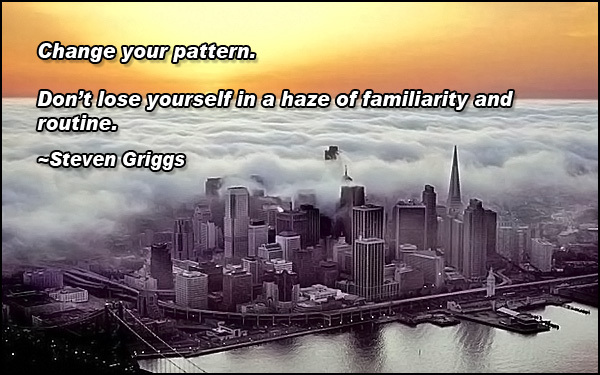 Don’t lose yourself in a haze of familiarity and routine. Change it up and keep refining your script.